I look forward to your continued interest in my posts and your comments on them. In the asset management world measuring performance through the right KPI’s is important, focusing on the results of the asset management processes and adjusting regularly to the trends seen on the dashboards is vital to continuous improvements. However it is not enough just to focus on the KPI’s, one always needs to be aware of what is behind the KPI’s, what behaviours KPI’s are driving and what is the ultimate goal for the business as a whole. A batch production process breaks down, it is a small component that is relatively easy to change, just takes a few hours to do. However, the spare part is not available in stock and it will take 2 weeks to get that spare part. Luckily, they have two exactly the same types of processes side by side and the production batch cycles allow for the part to be taken from one manufacturing process and installing it on the other process while the batch preparation is done. Thus not affecting the production and delivery of the product is without any production losses noticeable. So the Maintenance Supervisor adapts to this situation and had a Maintenance Technician perform the switch regularly keeping the production, as well as the customer, happy because production went as planned. However when focusing on the maintenance KPI parameters this results in an increased Break Down Maintenance over the 2 week period, as they needed to move the part from one process to the next in line with the batch production cycles. This also resulted in non-compliance to part of the PM program, as the maintenance technician did not have the time to do all the planned PM’s because of the added Break Down Maintenance. It can also be assumed that because the PM’s where not done that could result in further unforeseen breakdowns. The Maintenance Manager comes to the Maintenance Supervisor not happy with his decision, because he monitored the KPI’s and could see that the Maintenance KPI’s, noticeably the break down KPI and PM compliance KPI where not trending in the correct direction. After weighing the options and understanding the story behind the KPI’s development the Maintenance Manager agreed that out of a bad situation the Maintenance Supervisor selected the best possible path. If everyone is focused on a single dominating goal, it is less challenging to adjust to situations as described in the example here above, as long as we understand the underlying attributes that affect the KPI’s developments. However in a silo situation where there might be tension between the silo’s (e.g. production vs. maintenance). In that case the example might have developed in a different way, i.e. half the production down for 2 weeks because of a failure where the spare part cannot be delivered for 2 weeks, the maintenance KPI’s would suffer a bit (one break down) but the production KPI’s would suffer even more. Is there a clear understanding in your organization for the why’s of the decisions that are made, i.e. are there clear governing goals? Do you sometimes sacrifice your goals for the greater governing goals? And are you recognized for that? I welcome your feedback and discussions below this Blog post. Blog on a poll asking: What do you think is the most important aspect of Asset Management? A while back I posted a poll with a few possible options as answers to this question and in this blog I will publish the results and some thoughts as well on this. Poll result on the question: What do you think is the most important aspect of Asset Management? Good Communication with all involved!!!!! I voted for the continuous improvement approach. The meaning of that approach, however, should include ongoing communication with major equipment suppliers to assure that the bill of material for the equipment is up to date. All other planning will fall short if replacement parts are not available to support maintenance and reliability efforts. I don’t see a lot of difference between some of the categories. Some could well be a component of another. All companies have headline business policies irrespective of whether they are explicit or not, though clearly a well defined policy will be better communicated, however, I believe that at the heart of the asset management process is the strategy. A clear map of where we are – where we are going and how we will get there! A cyclic process of continual review and course adjustment whilst in operation will complete the process. Thus without a well defined strategic core, asset management initiatives will fail. I have been acting long time maybe too long as a management consultant and still I can see alot of unefficiency on a shop floor lever. Examples of these areas are e.g. maintenance planning, multiskilled people, bad collaboration between production, production planning, sales and maintenance. I agree with the opinion a maintenence strategy is mandatory, but in this changing world sometimes the business strategy/goals of a company can be a bit “fuzzy” too and then subgoals/strategies can be even more difficult to give or get. So, quite practical approach can give sometimes a faster and higher ROI>>>Fix things you can and leave the rest! Above you have now seen all the raw data from the poll and comment´s made to date. I would like to leave the interpretation mostly to you, my dear reader, as I know the people who read this blog are quite intelligent people working in the great field of Asset Management. 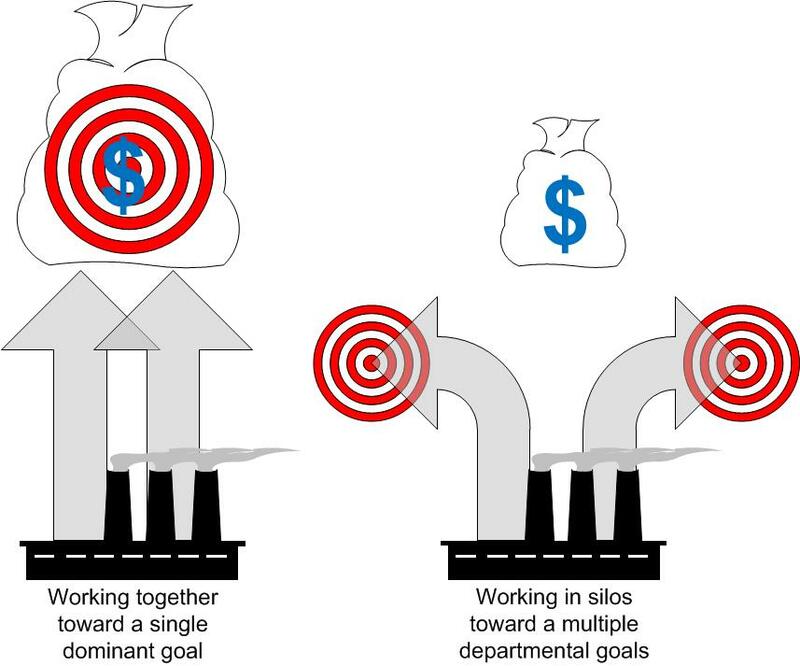 As we can soon see in the emerging ISO5500x series of standards Asset Management is a very iterative management system and as with most systems as soon as one element of the management system is taken out the whole system will not be as effective in delivering the results that are desired. I can say that the results overall do not surprise me for one and I would like to encourage you all to comment and discuss the results in the comments section here below. Would you like to answer this quick poll please? 2012 in review, a blogging stats. Watching this video from www.TED.com where Simon Sinek is talking about the power of “Why” made me think a bit about why do I do what I do. Here are my conclusions. For me, it would be because of the multiple complexities of my job. I love tackling them and experiencing the positive results as well as learning from the less positive results. For me, Asset Management is the greatest field of working possible to be in, I have a real passion for it. I am lucky enough to have worked in this field with many great people throughout my career. Learning every step of the way more and more, realizing that there is seldomly only one correct way to go in any given situation. This is where the complexities of Asset Management come into play; there are so many aspects to consider that it is almost impossible that there is always only one correct way to go. The Asset Management world is rarely only White OR Black, we seem to live in constant changing levels of grey. In addition, this is a great place to be if you enjoy constant challenges like me. So why do I do the things I do is because I love being challenged, and working in Asset Management ensures that I am constantly challenged! I now challenge you to take a moment out of your time and look at the video from Simon Sinek, after you have watched it think about why you do what you do and hopefully continue to have a great passion for it. Thank you for reading my blog. I do try to post here regularly, however I am also very lucky to have a lot of work to do and a lot to enjoy at home so therefore I have little free time to blog. Thank you for understanding and please leave your comment. In an asset intensive environment an integral part of Reliability is Safety, in other words when reliability increases so does the safety. It is always a pleasure to see that when reliability initiatives are starting to have a positive effect on equipment, people and processes the safety Key Performance Indicators (“KPI’s”) go up as well. But why does this happen and which is coming first? Is it the safety or reliability? I say reliability comes first then safety, people become more comfortable and positive in their respective roles because the processes are under more reliable control and safety is one of the positive side effects of reliability. Safety is very instinctive in nature; that is to say when a problem arise instincts are what drives the situation more than anything else. Instincts say that one can react to the problem in a particular way, unfortunately often ignoring or not noticing the dangers that are present. Reliability, if that definition can be used in this situation, is almost nonexistent; that is to say there are no failure mode focused or planned maintenance activities and therefore the maintenance activities are all reactive or break down maintenance. Behavior is all reactive; in a reactive maintenance regime it is close to impossible to expect anything else. Safety is enforced; through planned maintenance activities safety procedures are most often enforced through the planning process. Reliability is scheduled; scheduled maintenance activities can support reliability initiatives. Focusing maintenance activities on failure modes, therefore preventing failure obviously contributes to increased reliability. However one needs to be mindful that too much planned maintenance can backfire. Focusing on the wrong maintenance activities (the ones not focusing on the failure modes, etc.) will not help and last but not least the maintenance induced failures also contribute to less reliability. Behavior is guided; through the planning process safety procedures are usually a part of the Planned Maintenance procedures and thus enforced. Safety is embedded; in a pro-active environment safety conscience is a second nature. Embedded in all levels of the organisation, responsibility for safety is everyone’s role and viewed as an added value to the business. Reliability is Continuously Improved; in the Pro-active maintenance environment maintenance activities are not only performed, they are always performed in a way that focuses on how they can be improved. It also focuses a lot on condition monitoring and only intervening when failure modes are measured as trending up. 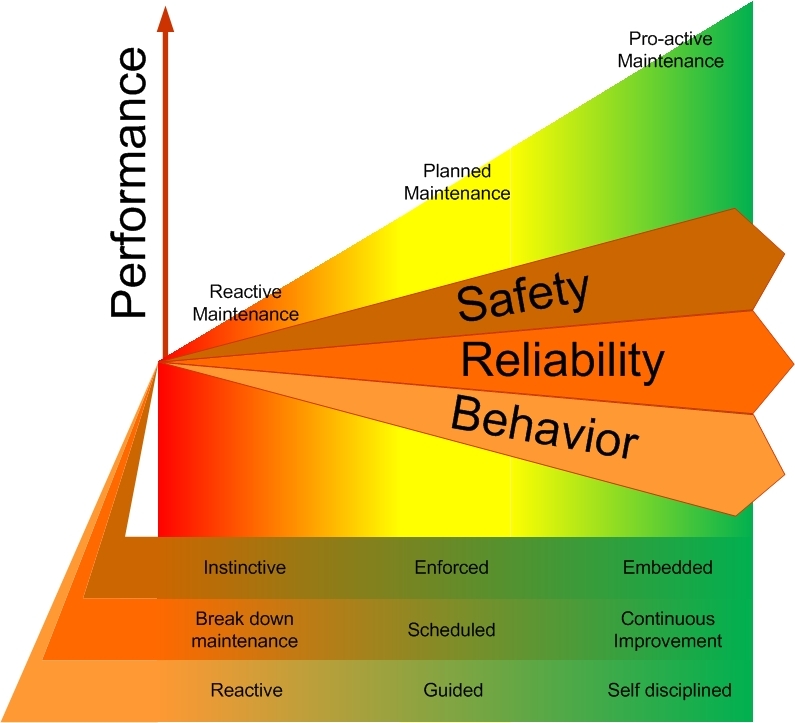 Behavior is self disciplined; in a pro-active maintenance environment the behaviours are self disciplined to focus on reliability continuous improvements with embedded safety in all aspects of the maintenance and production environment. 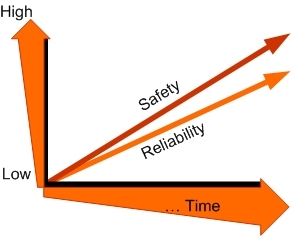 As can be seen above the development of Reliability and Safety have a strong correlation. Focusing on increased Reliability will promote the right behaviours and result in better safety KPI’s. In addition to all these great benefits to the organisation it will also have a positive impact on the productivity and therefore profitability, which is always a good added benefit to any initiative. Hi I am Bjarni and here I will Blog about matters related to Maintenance & Reliability. I hope you will enjoy it and please leave a reply, I would appreciate your involvement.